This documents how I transferred from a website using Snitz and an access database to a new site with BBress using Mysql. BBpress has a conversion tool that lets you import data from several other forum packages. However two things are needed for this to work. 2. A convertor programme that understands the structure of the source (in this case Snitz) forum. If you already have a MySQL verison of Snitz (Snitz supports Access, MS SQL, and MySQL), then you’ll still need to fix the date, and run a specific Snitz converter, but don’t need the upload to MySql in step 2. I can only describe how I achieved this, I suspect there are lots of ways, but this one worked. This is how they showed in my Snitz database, but the prefix may be different with yours. Where column N contained the old date. I then prefixed the original heading with OLD (eg heading T_DATE became OLDT_DATE) and headed the new column with the heading of the old one (eg T_DATE). I did this to a) preserve the original columns just in case, and b) to use for the clean slug in the conversion (see later). I then deleted the old table in access, and imported the two excel ones back into Access (as before external data, then import). I then had the same access database, but with the correct date formulas and a couple of extra columns with the old date format in them. The first thing you’ll need is a MySql database to upload to. You can use the one you presumably already have with WordPress/BBpress. However you’ll just need to check that none of the names co-incide. Since my Snitz database used capitals (I don’t know if they all Snitz databases do), and BBpress uses lower case, I suspect that there is no risk in doing this, but one for you to consider. I took the safety of creating a fresh blank database (my hosting package allows the creation of databases and manages them through phpMyadmin). There are numerous programmes on the web that do access to Mysql conversion, but for no particular reason I chose Bullzip http://www.bullzip.com/. However this needs a 32bit ODBC driver to work, so unless you already have Mysql on your local PC, you’ll need to download the driver from http://www.mysql.com/downloads/connector/odbc/ – choose the 32 bit one. Once installed it is a doddle to do the conversion. Run the wizard, and it’ll upload in minutes. Finally if you’re going to do the date conversion discussed in Step 1 at this stage, now’s the time to do it. This is easy once you’ve got your head around it, but initially it can be very frustrating. In essence you need to translate what one forum calls something to what the other needs. I used OLDR_DATE & OLDT_DATE from the step 1 as my clean slugs. A slug is what BBpress uses for a URL to reference a post. It needs to be clean – ie not have formatting, odd characters like spaces etc. in it. I did debate using the topic ID, but was unsure if this was unique for BBpress – it may well be fine. So I used the references above as I was pretty sure that with our forum being not that busy, that no two people would have posted in the same second. If you choose to use some other field, such as topic ID, you’ll need to change the field in the converter document – see below. This is then used against the example converter that BBpress supplies. Whilst initially looking daunting, this is fairly easy to change to get it to work. * Implementation of snitz converter. If you don’t do this, the converter won’t recognise it. Then you need to work through each of the lines of code changing the “default” source database tables and names to the correct ones. // Forum id. Stored in postmeta. Using the translation table above you work through each of the lines, doing the substitution. Store old user salt” and “User password verify class” sections as passwords won’t come across – see later on this. CRITICALLY I also added the following as the example doesn’t had a bit that brings the actual topic content across ! // Note: We join the posts table because topics do not have content. Once all that is done, save the file locally. Now you’re ready to run the conversion! Select “snitz” from the converter list, and fill in the database info from above. Click to select users, presuming that you want to bring these across. If it falls over, then you’ll need to work out which part of the snitz converter it doesn’t like (it’ll give you a line number). Usually you’ve got punctuations wrong, or called something by a wrong name. Remember snitz (in my case anyway) uses capitals, and bbpress needs lowercase, so ensure that’s all ok. If nothing comes through (it usually says “starting conversion…conversion complete”), then you have got the connection wrong, as it’s not finding the database and tables. Then you’ll need to repair the links (Dashboard>tools>forums>repair forums). Otherwise in my case the forum listings came through, but with no topics listed against them. Do as the tool suggests – I ran several at the same time, and wrote most of this document whilst waiting ! If you successfully imported your users, they’ll have accounts, but their passwords won’t work – Bbpress can’t bring these across. The easiest way is to tell them to click “lost password” and enter their email address and then they can reset their own. And that’s how it’s done ! Thank you for detailed answer. Only one more question: It is very important for me that the forum must be very stable and perfect to use by our visitors. Isn’t it hazardous to use the bbPress 2.6-alpha version instead of the stable bbPress 2.5.8 version? v2.6 is very mature and close to release. But of course it’s your decision. 2.6 is incredibly stable, its nearing, and has been, pretty close to being ready for release for quite some time, bbpress.org and wordpress.org are using 2.6 perfectly if that helps. I am going to give a try and I’ll tell you my experiences. Well, I installed the v2.6, modified the converter.php, imported the data and now everything works perfectly. Thank you gentlemen for this great help! For a while seemed everything fine, but I had to notice there is something wrong with the users. I can find them in the new database, everything in the right field, but I cannot use them. If I send the forgot password email, choose a new pass and trying to login, the system does nothing, I can see only a big white screen. I run the forum repair more than once, but two of them (sync-all-reply-positions and user-role-map) interrupts all the time and I have to see the big white screen again. I’m guessing the sync-all-reply-positions fails because of some incorrect meta for the replies, theres also a few known issues with this tool timing out when used on sites with lots of replies. The user-role-map repair tool should work fine, no known issues with this one. What happens if you create a new user, just a new WordPress user, can that user login, create topics and replies etc? What happens if you now remove all the imported users and run this repair tool again, theoretically it would only be running on “native” WordPress users and not any imported users, (i.e. “admin” and “test user” only), does the repair tool still fail? Registering and using a new user after the import is works fine as well as using an old user, registered before the import. I tried with the bbpress v2.5.8, but I was unable to run the user-role-map repair tool either, I got the white screen there too. Tried to turn off all the other plugins, increasing the memory, but nothing changed. How do you think to delete all the users? Only the users or users and their posts too? As I checked the converter again, I found that during the test period I changed the default value to “special” in this part below. Is this could cause the error? I changed the default value to “special” in this part below. I don’t think this would cause that error, the fact that I’ve no idea what is causing that error “could” be in fact the cause of the error. 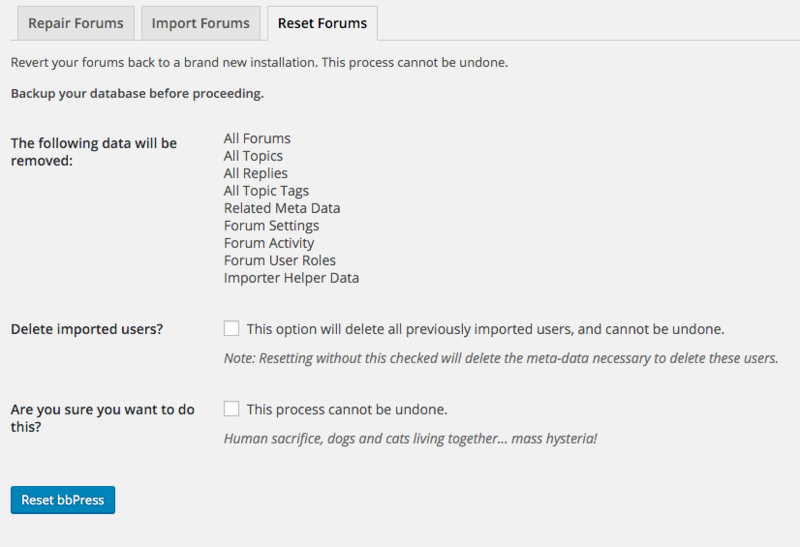 The “Reset Forums” tool includes the ability to delete all bbPress forum content and imported users, run this and that should get rid of your ~30k imported users. After that, try changing that “special” back to “Snitz” (I think thats what it was) and se what happens. In the original Exmple.php the ‘default’ => ‘Example’, but the phpbb sample the ‘default’ => ‘phpBB’ and the SMF sample the ‘default’ => ‘SMF’ was. This is why I thought I can change to any text. Anyway I am going to change the value and see what happens. I’ve just pushed a new 2.6-alpha that includes a fix for deleting imported users, it wasn’t behaving as it should.